"A Quiver for Lapsed Romantics"
On Valentine’s Day 1953, LA native Don Bachardy (age 18) and internationally recognized British author Christopher Isherwood (age 48) began a relationship that would last thirty-three years, until Isherwood’s death in 1986. A film about their life together, Chris & Don: A Love Story, was released in 2008. Their home in Santa Monica Canyon was a salon for the local artworld and a mecca for artists, writers and composers visiting from abroad. Early on, Bachardy developed exceptional drawing skills and for the past 50+ years he has made portraits from life (never from photographs) becoming one of the most recognized portrait artists of our time. 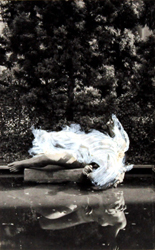 Previous exhibitions at Craig Krull Gallery have focused on his Self-Portraits (Jan/Feb 2010) and his Portraits of L.A. Artists (Sept/Oct 2011). 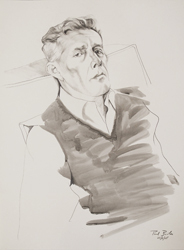 The exhibition opening in Sept 2013, entitled Literary Figures, will feature 18 portraits of authors such as Aldous Huxley, William Burroughs, Anaïs Nin, Paul Bowles, and Annie Proulx. Each of these portraits was signed by the subject, and in fact, the Allen Ginsberg portrait includes a hand-written poem that Ginsberg composed while looking out the window at the Pacific Ocean during the sitting. Concurrently the gallery will present an exhibition of new work by Stephen Aldrich. A pivotal moment in Aldrich’s career occurred in 1968 when he met the influential photographer, Frederick Sommer. A musician and art student at Prescott College in Arizona, Aldrich was soon enlisted by Sommer to interpret his innovative, abstract musical scores, thus beginning a long relationship of mentoring and collaboration. 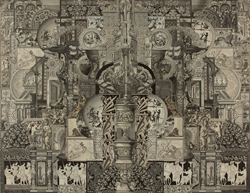 In the last decade of Sommer’s life, Aldrich worked with him on an extraordinary group of collages, while at the same time, developing his own unique approach to the medium. 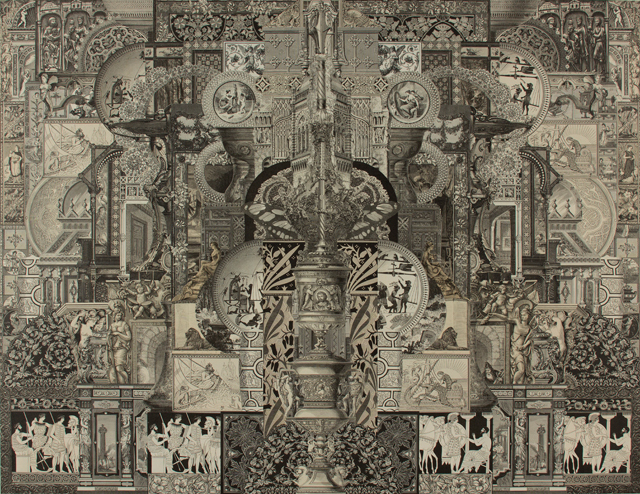 Working with fine 19th century engravings from books and journals as his source material, Aldrich cuts imagery with mind-boggling precision and complexity. There is an obsessive quality to the work in its overlappings, rhythms, repetitions and patterns that may, in part, be attributable to his background in music. In our small gallery, twelve of Ned Evans’ postcard collages from 1979-1991 will be exhibited alongside the texts of twelve 200-word love stories written by his wife, Rebecca Cox. Cox made these pairings of collage and text as she searched through Evans’ archives looking for images that would complement her work. The result was a 36-page, 8x8” book entitled, A Quiver for Lapsed Romantics. Complementing the literary themes of these three exhibitions, the gallery’s foyer will feature works from Danae Falliers’ series, Library. These color photographs of books on shelves are subtly manipulated so that the books, though still identifiable as books, become slightly blurred, linear, geometric abstractions.